The BPMDS series has produced 11 workshops from 1998 to 2010. Nine of these workshops were held in conjunction with CAiSE conferences. From 2011, BPMDS has become a 2-day working conference attached to CAiSE (Conference on Advanced Information Systems Engineering). The topics addressed by the BPMDS series are focused on IT support for business processes. This is one of the keystones of Information Systems theory. The goals, format, and history of BPMDS can be found on the web site http://www.bpmds.org/. This special section follows the 17th edition of the BPMDS (Business Process Modeling, Development, and Support) series, organized in conjunction with CAISE’16, which was held in Ljubljana, Slovenia, June 2016. BPMDS’2016 received 48 submissions from 31 countries, and 19 papers were selected and published in Springer LNBIP 248 volume. The focus theme of BPMDS 2016 was “Business Processes in a Connected World.” It embraced three areas of research, covering different aspects. The first area of research is about how business processes are able to connect people. It investigates how the communication, coordination, and collaboration of individuals can be improved. The second area of research refers to the aspect of connectivity with intelligent objects. More and more things get connected and thus become potential actors within business processes. The third aspect of connection addresses the increasing integration of external information, data and knowledge sources. They become increasingly important for decision making. This special section is targeted at both researchers and practitioners in the information systems community with a focus on “Business Processes in a Connected World.” The eight papers in this special section reflect this focus. They are extensively revised and extended versions of research papers that were initially presented at the BPMDS’2016 working conference and passed again a blind review for the special section. The paper “Theoretical foundations and implementation of business diagrams complexity management technique based on highlights” from Gregor Jošt, Marjan Hericko, and Gregor Polancic investigates an approach that reduces the perceived complexity of business processes diagrams without changes to the notation used. The paper is based on a literature overview and an exploratory case study. The implementation of the proposed solution is done in form of a prototypical software solution. In their paper “Consistency requirements in business process modeling: a thorough overview,” Afef Awadid and Selmin Nurcan give a thorough overview of consistency requirements in business process modeling. In this way, they lay the foundations for a comprehensive investigation of this challenging subject and empower significant contributions to it. The paper “Toward a framework for self-adaptive workflows in cyber-physical systems” authored by Ronny Seiger, Steffen Huber, Peter Heisig, and Uwe Assmann proposes a framework for self-adaptive workflows in CPS (Cyber-physical Systems) based on the MAPE-K feedback loop. Unanticipated errors are checked for by loop monitoring and analysis of additional sensor and context data. The framework facilitates the separation of “regular” workflow views from CPS aspects. The feasibility of the approach is shown in a smart home scenario. The paper titled “Managing time-awareness in modularized processes” from Roberto Posenato, Andreas Lanz, Carlo Combi, and Manfred Reichert tackles the handling of temporal constraints for modularized processes with the intention to enable both the reuse of process knowledge and the modular design of complex processes. The paper presents a method to derive the duration restrictions of a time-aware (sub-)process in such a way that its temporal properties are completely specified. This characterization of a process is helpful when reusing it as a subprocess within a modularized process. The paper “Selecting a process variant modeling approach: guidelines and application” from Banu Aysolmaz, Dennis M. M Schunselaar, Hajo Reijers, and Ali Yaldiz reports on an action research study to perform a comparative process variant modeling application in a process management consultancy. The authors describe how the requirements were determined. Starting from this, two specific approaches were selected, the Decomposition Driven Method and the Provop approach. They were evaluated according to their suitability for developing variant models for six software project management processes of five customers. The research on “Searching textual and model-based process descriptions based on a unified data format” from Henrik Leopold, Han van der Aa, Fabian Pittke, Manuel Raffel, Jan Mendling, and Hajo Reijers addresses the issue that existing techniques for automatically searching process repositories are limited to process models and do not search textual descriptions supplementing the models as found in many organizations. Therefore, the authors propose a technique that is able of searching textual as well as model-based process descriptions. Activity-related is automatically extracted. Behavioral information both from models and texts is captured and stored in a unified data format. The paper “Semi-automatic derivation of RESTful choreographies from business process choreographies” authored by Adriatik Nikaj, Mathias Weske, and Jan Mendling addresses a gap in research on the systematic engineering of collaboration of RESTful services. The authors define a semiautomatic method for the derivation of RESTful choreographies from process choreographies. The method presented uses natural language analysis techniques to derive interactions from the textual information in process choreographies. In their paper “Connecting databases with process mining: a meta model and toolset,” the authors Eduardo Gonzalez Lopez de Murillas, Hajo Reijers, and Wil M.P. van der Aalst propose a meta model to integrate both process and data perspectives, relating one to the other. In this way, it is possible to generate different views from the database at any moment in a highly flexible manner. The approach presented decouples the data extraction from the application of analysis techniques, enabling the application of process mining in different contexts. We wish to thank the referees from the BPMDS’ 2016 Program Committee members for their timely and accurate reviews during the two-round and blind review process for this special section. 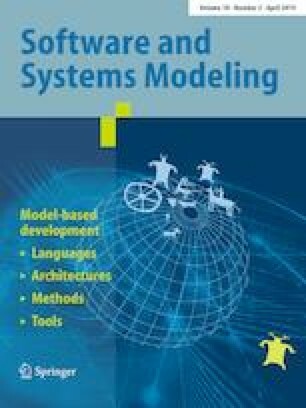 We would like to thank the Editors-in-Chief of the Journal of Software and Systems Modeling for agreeing to publish this special section. We particularly would like to thank Martin Schindler for his support in helping us to put this special section together. Our gratitude goes to all authors, from BPMDS’2016 and from the open call for papers, who made this special section possible by submitting their work and revising it according to the reviewers’ comments.